They say, A friend in need is a friend indeed. On board ships, who can be your real friend who will help when you are in real need. Did I hear, Life saving equipments ? You are absolutely correct. Life saving equipments are the only equipments on board which are for us. Do you agree ? These are not there because of any cargo requirement, or any commercial need. And yet, we find so many observations on life saving equipments during external inspections. 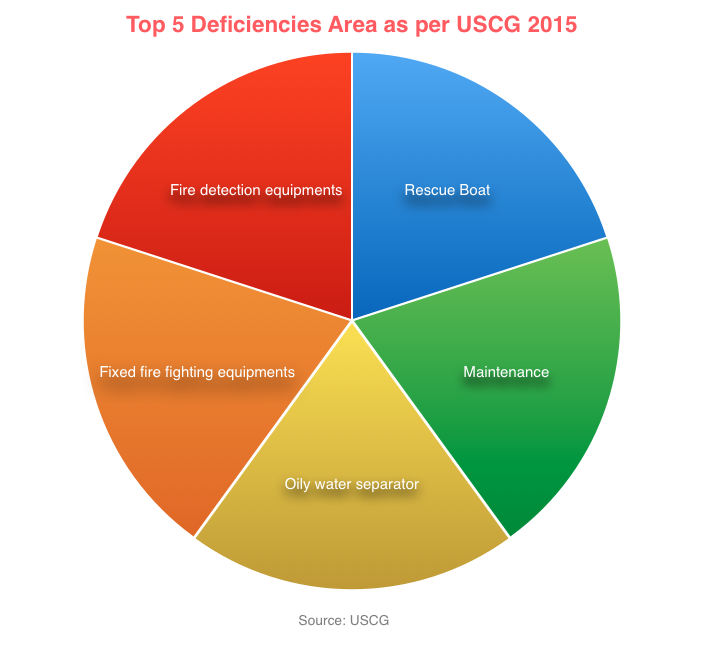 For example, as per USCG, detentions due to “rescue boat” was one of the top 5 deficiencies in 2015. Isn’t it a worrying factor ? It surely is. So Lets see what maintenance we need to do on free fall lifeboats to ensure that everything is alright. Every 3 months we can lower the lifeboat either by free fall launching or by secondary means of launching. If lowering by free fall, the required crew need to sit inside the boat and launch it from inside. Otherwise, we can lower the free fall lifeboat to water by davit. Crew can then board the lifeboat by embarkation ladder. Irrespective of how we lower the boat, we need to manoeuver it in water every three months. We need to test the engine and sprinkler system during manoeuvring. If you are lowering the boat every 3 months by free fall means, there is no other thing you need to do every 6 month. But if you had lowered the boat by secondary means such as davit, you need to lower the boat by free fall every 6 months. Or you can carry out simulated launching provided lifeboat has the provisions for that. Now what does it mean by “simulated launching” of the free fall boat ? Simulated launching replaces the requirement of lowering the lifeboat by free fall method. When we lower the lifeboat by free fall method, we are testing the release mechanism of the lifeboat. Simulated launching does same but without lowering the lifeboat with free fall. In simple words, the boats that are fitted with simulated launching has a securing wire. One end of this wire is connected to boat and other on the ship structure. When the boat is secured, this wire will be loose with no weight on it. One crew will operate the release gear of the boat. Once the boat releases, after moving slight distance, simulation wire will hold the boat. This test will make sure that the release mechanism is working. After simulation test, the boat then need to be lowered with davit and manoevered in water. Every company has a weekly and monthly checklist for lifeboat which we have to follow. But as a minimum, we should do following maintenance on free fall lifeboat. It is good practice to check lifeboat hull for any cracks during drills. We must repair any crack in the hull at once. Lifeboats fitted on tankers has self contained air support system. This is to maintain positive pressure inside the lifeboat in case of abandoning the ship in toxic environment. 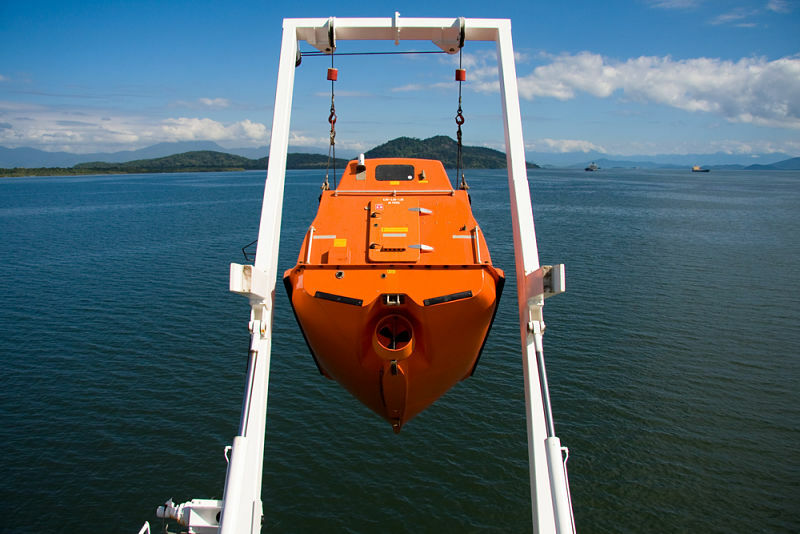 Positive pressure inside lifeboat ensures that toxic gases don’t find its way inside lifeboat. Every month we should check the pressure of the air bottles. The pressure of each bottle should not be less than 10% of the working pressure of bottle. Usually there are three air bottles in the lifeboat. When checking the pressures, we should check the pressure in each bottle. When doing so for the second bottle, make sure to close the valves from the first bottle. Also you should release pressure from the line before opening the second bottle valve. As I mentioned, we need to test the sprinkler system during maneuvering of the lifeboat. Apart from that every month we need to check and operate the sprinkler valve. This is to ensure that the valve is not frozen and we can open/close it easily. Every time, sprinkler is tested with sea water, it is good practice to flush the lines with fresh water. We need to test and run the lifeboat engine every week for at least 3 minutes (SOLAS Chapter III, Reg 20.6.3). If the ship is trading in cold weather, it is important to check if the fuel for lifeboat engine is suitable for these conditions. Every 5 years, we need to either change the fuel oil or send the fuel for analysis. As lifeboat fuel quantity is not considerable, renewing the fuel every 5 year is much economical option. Lifeboat battery supplies power for lighting as well as for starting the lifeboat engine. We have to make sure that battery can start the lifeboat engine multiple times. Many companies have a policy to renew the lifeboat battery every 2 or 3 years. There are number of components that shore service engineer checks during annual inspection. These can be divided in different sections. Lifeboat Exterior, Lifeboat internal, Lifeboat Engine, Lifeboat Release gear, Lifeboat Davit and Lifeboat Winch. SOLAS requirements divides thorough inspection by shore in two parts. 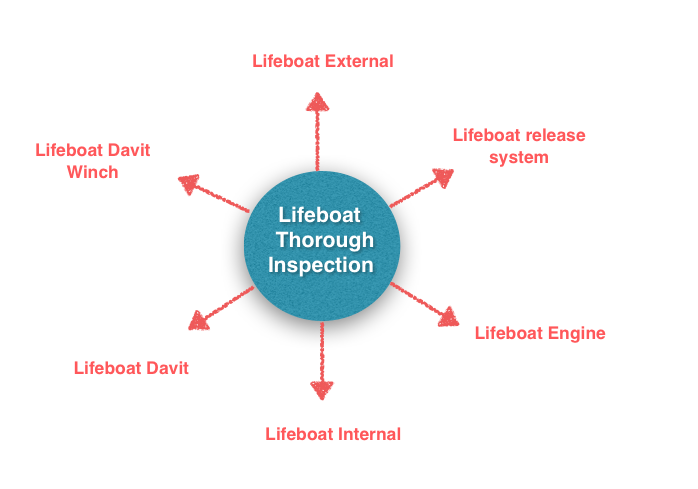 Every year, lifeboat need to be examined by the shore service engineer. Class issues SEQ certificate on the basis of this examination along with the inspection of launching appliances. We must make sure that before annual class surveys, the annual examination of lifeboats is complete. During annual inspection, the shore engineer will check all the components we discussed under ship staff maintenance. These include lifeboat engine, battery, sprinkler and air support system (if fitted). His checklist also include the inspection of lifeboat equipment inventory. We have already identified six areas that form part of thorough inspection. Each of these six areas further have many check points that service engineer will check. 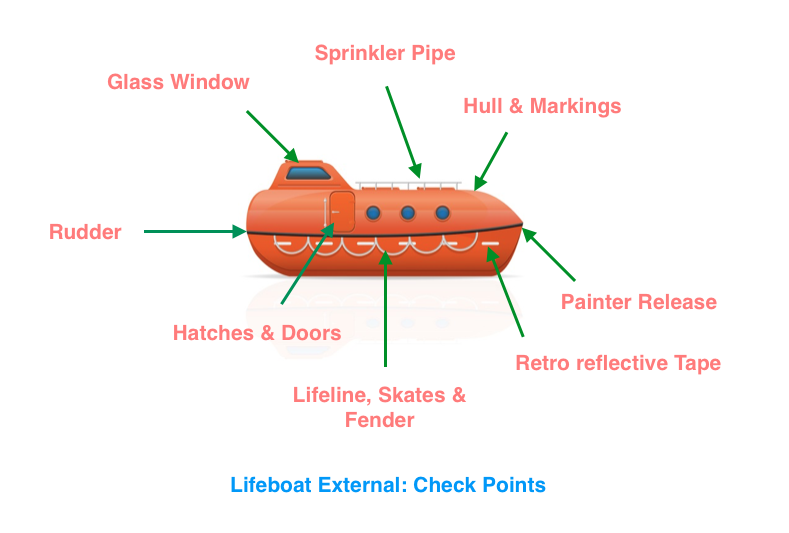 For example, external inspection of lifeboat will have many checkpoints. Checkpoints such as looking for any cracks in hull and opacity of window glass etc. Likewise the service engineer goes through the checkpoints for other areas too. Any shortcomings are brought to the attention of ship staff. Only after rectification of such deficiencies service engineer issues the service report. ii) Dynamic test of the winch brake every year with weight of the boat. iii) Operational testing of free fall lifeboat either by free fall launching with operating crew on board or by simulated launching. Launching appliance include the davits and winch of lifeboat, liferaft and rescue boat. So what does shore service engineer do during annual thorough examination of davit ? It is all in the name. Thorough examination means detailed inspection and that’s exactly what he does. Operational test of the davit. Again any deficiencies is brought to the attention of ship staff for rectification either by ship or shore. The davits of free fall lifeboat has hydraulic brake. For conventional boats, the brakes are opened up and checked for condition. But this is not required for free fall lifeboat davits. This is because, opening of hydraulic brake decreases rather than increases the reliability of the brake. The purpose of the dynamic test is to see if the brake can take the load of the boat. 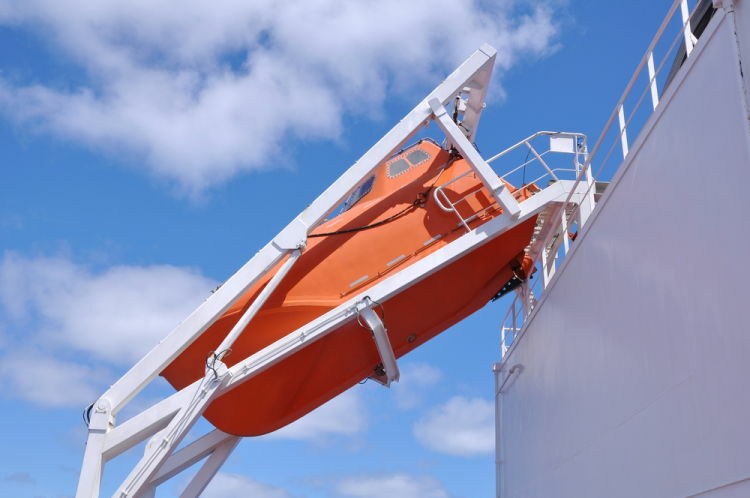 If the davit brake can hold the lifeboat in its position, we consider the test pass. If the brake does not hold and boat is moving even slightly, we consider the test as fail. As per SOLAS, Every year, this test needs to be done with the weight of the boat. For this, shore engineer just lowers the lifeboat with the davit to perform this test. SOLAS requires to carry out dynamic test with higher loads every 5 years. This load is 10% higher than the weight of the boat with all its compliments and equipments. Below picture shows the calculation of the weight for 5 year dynamic test. There are two ways in which we can conduct this test. 1) By placing the required weight inside the boat and then lowering the boat with the davit. 2) By suspending the physical weight on lifeboat davit. 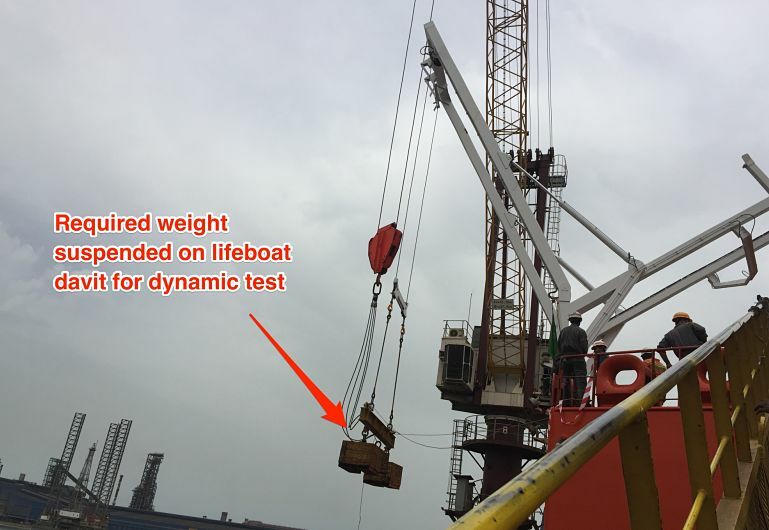 As this test is usually carried out in dry dock with easy availability of shore crane and weights, the second option may be the preferred one. On load release gear of free fall lifeboat is different than conventional boats. Some says that this does not come in the category of on load release gear. While this test is not required as per SOLAS for free fall lifeboats, it is still sometimes carried out during dry dock. Sometimes because of company’s policy or because of class insists it to be carried out. To understand the testing of on load release gear of Free fall lifeboat, we need to understand how free fall lifeboat is released. There are different arrangements for different make of free fall lifeboat and davit. But the fundamental principal is same. Free fall lifeboat holds onto a hook and this hook is released by hydraulic pressure generated from the hand pump inside the lifeboat. As the hook releases, the boat slides on the channel to drop into the water. Lets look at one of such arrangement. Have a look at photo below. As you can see, the boat is holding onto a rod. There are two pins protruding from inside the lifeboat. When we increase the hydraulic pressure through pump, the pins start moving outwards. As the pin touches the rod, and as we keep increasing the pressure, pins lifts the boat upwards. At one point, boat is clear of the rod, and boat moves through the channel to drop into the water. See below close up photo for more better view of pin and bracket holding the boat. The two pins would not move together. Only one pin would come out and lift the boat to release into the water. The second pin is for emergency system for lowering. This is used when primary system fails. Now that we know how free fall lifeboat’s release system work, We are in a better position to ask ourself this question. 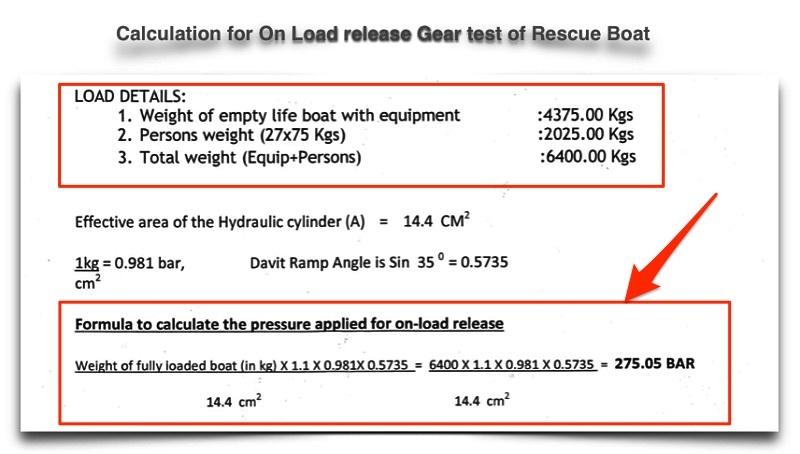 What do we mean by on load release gear test of free fall lifeboat ? The pin we mentioned, need to push the weight of the boat including the weight of all the crew sitting in the boat. What if, there is leakage in the hydraulic system. Or what if hydraulic pump cannot generate that pressure to lift the boat enough to release it. When we talk about free fall lifeboat on load release gear test, we are talking about testing the capacity of the hydraulic system. This is to ensure that it has enough power to lift the boat. I keep saying lifting the boat on the basis of release gear example I mentioned earlier. But the design of the release can be different. Some design require the securing pin to release by the hydraulic pressure to release the boat. 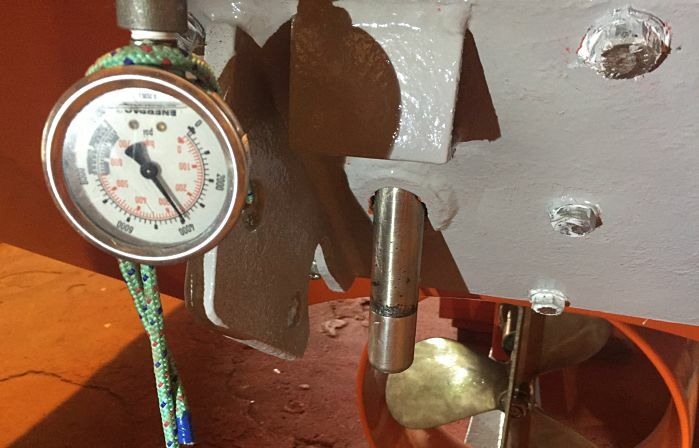 Nonetheless, it is hydraulic pressure that removes the lifeboat from secured point to release. On load release gear test is done with 10% more weight than the weight of boat + weight of all crew. Though this is the requirement for conventional boat, same criteria is applied for free fall lifeboats if it is carried out during dry dock. How this test is done ? First calculate, how much hydraulic pressure is equivalent to the required test weight. This is simple mathematical calculation which I will not go deep into. Below is the actual calculation for one of the ship. As you can see, Hydraulic system of this ship need to generate & hold 275 bar pressure to pass the test. During dry dock, in the yard workshop the hydraulic system is pressurised to perform this test. Below is the photo of actual test for the same ship. More and more ships these days are fitted with free fall lifeboats. And the main reason for that is ease of use and ease of maintenance. There are certain maintenance requirement as per SOLAS. And we need to make sure we do that. The maintenance include both that can be done by ship staff and the one done by shore service engineer. Ship staff need to do weekly and monthly checks which usually form a part of on board company checklist. Shore engineer need to perform annual and 5 Yearly tests. As long as we carry out maintenance as per schedule, we can be sure of operation condition of the lifeboat. Quite elaborate and informative article. MSC Circ 1206 Rev 1 gives a detailed information on what all elements need to be checked during annual & 5yearly inspections and it mentions checking the condition of hydraulic hoses. There is no statutory requirement per se to change the hoses but it is considered as the best practice to change the hose & many companies have renewal of hose as a 5 yearly job in their PMS. As you rightly said about denso, these are useful but does not eliminate the need of checking the coupling at an specified interval in PMS. If applied, there should be a PMS job to remove and check the condition of coupling say every 6 months. Thanks for pointing out these very good points. Regarding the anchoring, both school of thoughts are right. Both methods have pros & cons as I have mentioned in that blog. 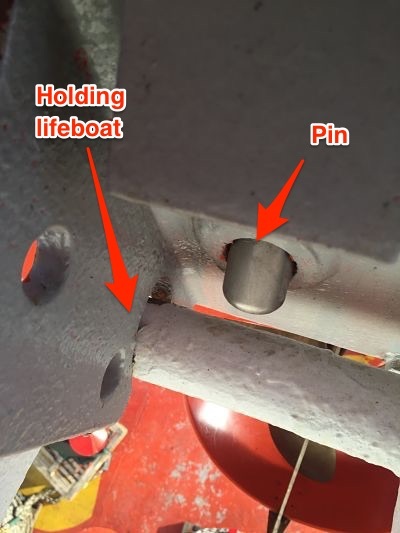 As I had said, the problem with chain resting on the stopper is that in high wind force, the stopper can deform and in emergency we may not be able to pick up the anchor. But if we combine this fact with the fact that most of the companies do not allow the vessels to stay at anchor if wind force is more than 6, the stopper should not deform. I personally used to rest the cable on the stopper but it would be wrong to say that other method is completely incorrect. 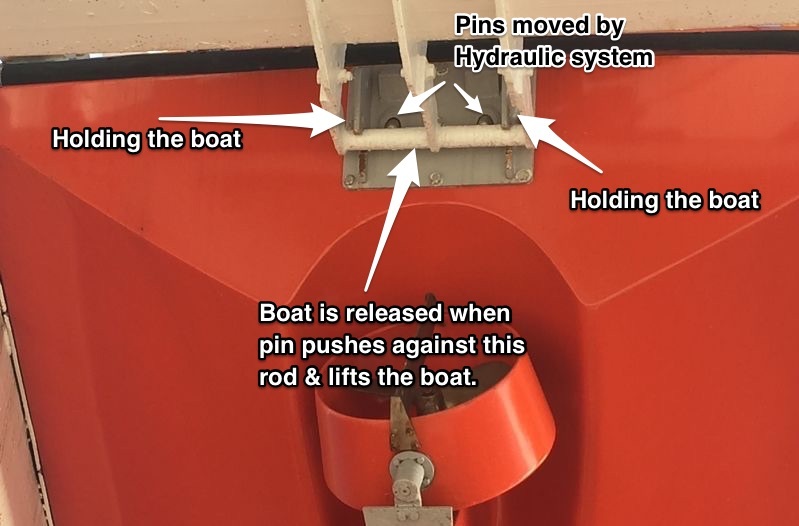 I have seen FFLB without hydraulic release system, fitted with normal lever and wire system to lock down the hook which is holding the boat with a strong point on ship by means of a chain. So how to do the onload release testing on such system . Secondly what is frequency of onload release testing on both types of boats.? 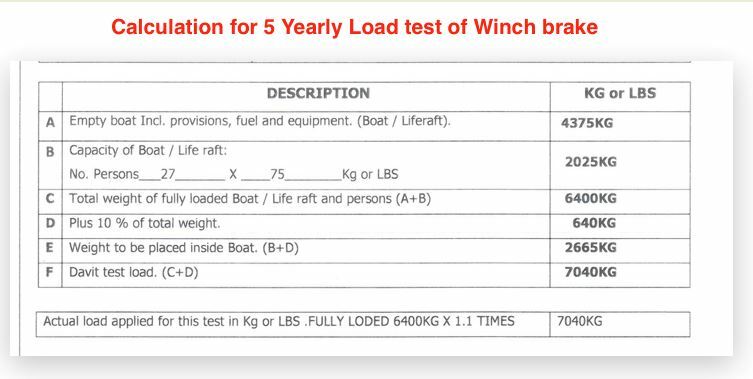 If you have system with no Hydraulic to lower the FFLB, for 5 year load test, physical weights (like sand bags) equivalent to the 1.1 times the weight of fully loaded boat (empty boat + full complements + all equipments) are put into the lifeboat. It is then secured with the davit as a safety measure and released from inside the boat. Test will pass if we are able to release the boat with this full load. Good day sir i really liked all ur articles, dey are elaborated quite well,sir i heard term ERD ,what does dis mean? Hi Milan, sorry to have missed your comment. If by ERD you mean Emergency recovery Device (called recovery stropes) then it is Nylon straps used for recovery of on load release lifeboat in heavy weather. thank you sir , very informative , especially the photos makes understanding very easy. Glad you liked it Avinasha..
Hi Rajeev, One question. The free fall boat HAVE to be launched in the water every three months, or 6 months? SOLAS want us to try to lower by free fall every 3 months But if it is not possible for some reasons, it allows us to lower the lifeboat with davit and then manoeuvre once every 3 months but it must be lowered by free fall atleast every 6 months. So it is OK to lower the lifeboat by free fall every 6 months but it must be manoeuvred in water every 3 months. Good day sir Rajeev, I have one question regarding lashing of FFLB is it necessary to remove during emergency?. The lashing of FFLB is quit small and its look like cannot withstand with the wait of FFLB. HI SIR I HAVE ONE QUESTION REGARDING FREE FALL LAFE BOAT, IS THERE ANY REQUIREMENT TO REMOVE L.B LASHING(TURN BUCKLE ) PRIOR PORT STAY, IF YES, IT IS AS PER WHICH REGULATION. Dear Sir, what is the minimum depth of water, required for launching of FFLB, for the 3/6 monthly test. Dear Sir, kindly advise if life boat can be painted on board? i really enjoy reading your articles sir. keep up the good work. your articles show the immense hard work you have done and knowledge you have gained and shared. i have read almost all the articles and has really helped me dispe lmy doubts. thank you so much. Thanks a lot. Very nicely explained in simple words. HOW DO WE GET EFFECTIVE AREA OF HYDRAULIC CYLINDER A , MENTIONED IN EQN. Nice article Sir,easy to understand. Q. When to secure the boat with Harbor pin?